Kelly Korreck, Ph.D., an astrophysicist at the Harvard-Smithsonian Center for Astrophysics, delivered the opening keynote. The Notre Dame chapter of AWIS’s mission is to initiate, encourage, and engage women in STEM in a welcoming and supportive environment, creating a sense of belonging and providing opportunities for success. 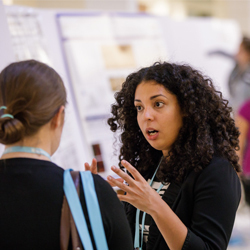 Their Women in Science Conference, an event hosted for and by female graduate students, aimed to provide an environment of empowerment for women and an arena in which strong relationships within a community of interdisciplinary scientists might be fostered. 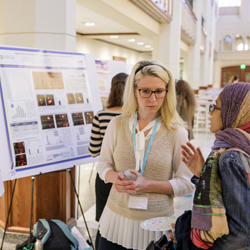 The first day of the conference began with poster presentations in the Jordan Hall of Science galleria. Brooke Weaver presented her research on kidney development in zebrafish. Weaver, a second year biology Ph.D. student specializing in organ development and aspiring to work in industry researching stem cells, sought to uncover aspects of nephron formation that are relevant to human kidney development and disease states. She explained that given the astonishing rate of development in Zebrafish embryos and the fact that 70 percent of their genes have human analogues these freshwater fish “provide a powerful conserved model to study nephrogenesis” and the developmental mechanisms driving the formation of nephrons, which can lead to kidney disease. Jamie Luther talks with another student about her research. 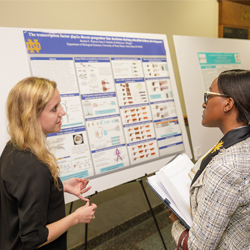 Jamie Luther, a sixth year analytical chemistry Ph.D. candidate, presented her work on the development of a paper analytical device (PAD) to detect and analyze adulterated milk. She explained that in developing countries, due to a lack of regulatory oversight in the supply chain, milk is often impure. In countries such as India, Bangladesh, and Brazil, milk containing additives, such as formaldehyde, hydrogen peroxide, urea, starch, and latex to preserve its appearance and prevent spoilage is often sold to consumers. Using technology developed at Notre Dame by Professor Marya Lieberman to detect counterfeit and substandard pharmaceuticals, Luther is developing a field-friendly milk PAD to detect low quality milk and detect the presence of contaminants. Brandy Martinez presents her research poster. Second year clinical psychology Ph.D. student Brandy Martinez presented her research on religious coping and emotion regulation in older adults. Martinez, who gained a B.A. in philosophy from Florida International University, explained that reading Aristotle’s Nicomachean Ethics as an undergraduate led her to question if being a good person is beneficial for human health. Her research has since been driven by the question of how we can live and age healthily and she aspires to a career in a clinical setting that also includes research. Martinez explained with vibrancy that her study investigated whether religious coping “buffers the effects of perceived stress on negative affect, and whether this interaction effect is associated with negative feedback functioning,” and involved monitoring cortisol levels in subjects who also kept daily diaries to track their moods. The event also consisted of three keynote lectures by scientists working in academia, government, and industry. 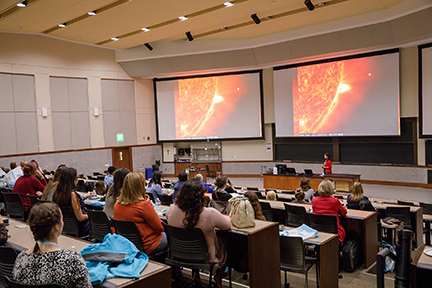 Dr. Kelly Korreck, an astrophysicist at the Harvard-Smithsonian Center for Astrophysics, delivered the opening keynote on high-energy astrophysics and the effects of space weather on day-to-day life, in addition to discussing her path from graduate school to a career in science. The second day of the conference included workshops on topics such as grants, fellowships, mentorship, and ethics, oral presentations, resume reviews, and networking opportunities. Visit AWIS-ND for more information and to learn about future events. Originally published by Chontel Syfox at science.nd.edu on October 10, 2016.